Heather and I made a special trip to Foster Burger (5339 SE Foster) last weekend to check out the new menu (pdf). Normally a restaurant’s launch of a new menu wouldn’t dictate our weekend plans, but this was different. 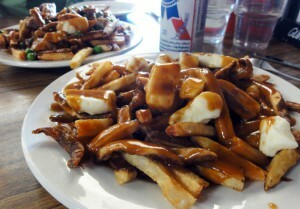 Foster Burger now offers six kinds of poutine! Dave got the Arleta Poutine, Foster Burger’s take on the traditional poutine Galvaude with roasted chicken and peas. I’m sort of not into peas. But Dave will pretty much put peas on anything. ANYTHING. So he was in pea poutine heaven. We each had our own plate and I ate every last bite. Read the rest at Portland Poutine!